- Publisher Here, in a beautifully illustrated, full-color book, are fifteen of the best-loved Christmas carols and songs that are so much a part of the traditions of the season. Here are words to know by heart and melodies to sing, with arrangements suitable for piano or guitar. These memorable carols are introduced by stories of the Nativity, retold from the Bible itself, with its message of peace and goodwill. A special treasure for the entire family sure to be used again and again in the years to come, especially by children and youth. - Publisher This beautifully illustrated, full-color book offers fifteen of the best-loved Christmas songs, introduced by stories of the Nativity. Music ideal for piano or guitar. 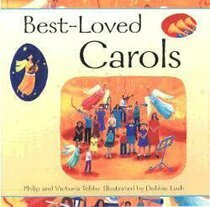 About "Best-Loved Carols (Music Book)"
Here, in a beautifully illustrated, full-color book, are fifteen of the best-loved Christmas carols and songs that are so much a part of the traditions of the season. Here are words to know by heart and melodies to sing, with arrangements suitable for piano or guitar. These memorable carols are introduced by stories of the Nativity, retold from the Bible itself, with its message of peace and goodwill. A special treasure for the entire family sure to be used again and again in the years to come, especially by children and youth. This beautifully illustrated, full-color book offers fifteen of the best-loved Christmas songs, introduced by stories of the Nativity. Music ideal for piano or guitar.